Next: Mallee Ringneck parrots feeding young » « Prev: Our wrens are back! For almost two years now we have had an Eastern Rosella occasionally visit our garden and patch of mallee scrub. During some weeks we see it several times a day, every day. 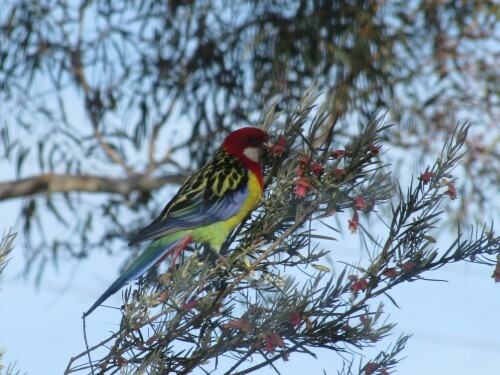 On other occasions it may only visit once and then not again for a week or two. It is an unusual visitor for a number of reasons. 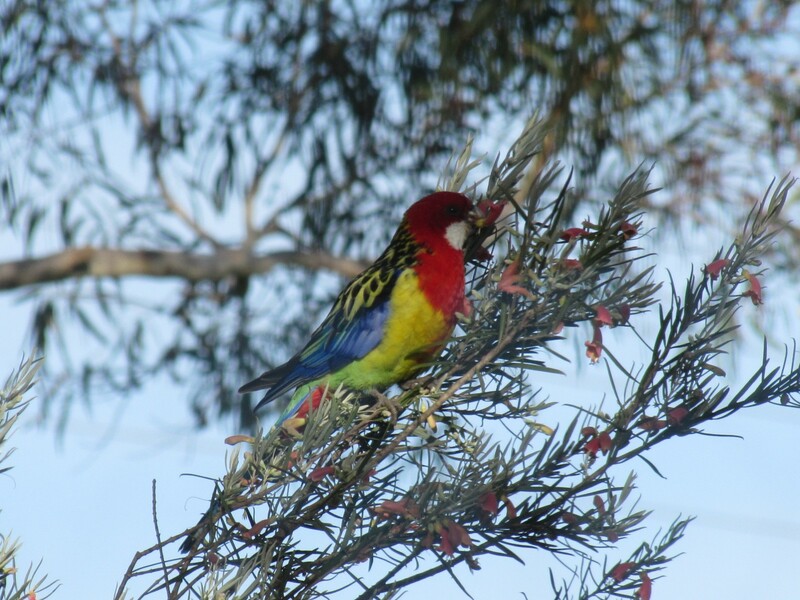 Eastern Rosellas are not normally found in the Murray Bridge region. They are common in the eastern states and even in the south east of South Australia. They have been introduced to the Adelaide region. All I can assume is that this species is extending its range or this one bird has escaped from someone’s aviary – or has been released. The other unusual matter relates to its behaviour: it is regularly seen in the company of a Mallee Ringneck. We have up to a dozen ringnecks around at any one time, but most of them do not tolerate this “interloper” and will vigorously chase it off. It keeps returning; such persistence. 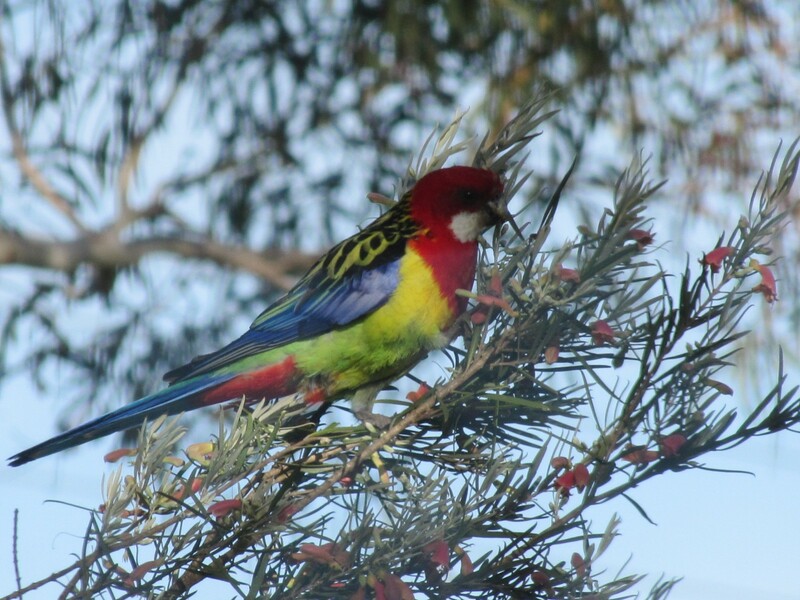 For the last month we hadn’t seen the rosella, but earlier this week it reappeared, again in the company of a ringneck and again being harassed by the other ringnecks. 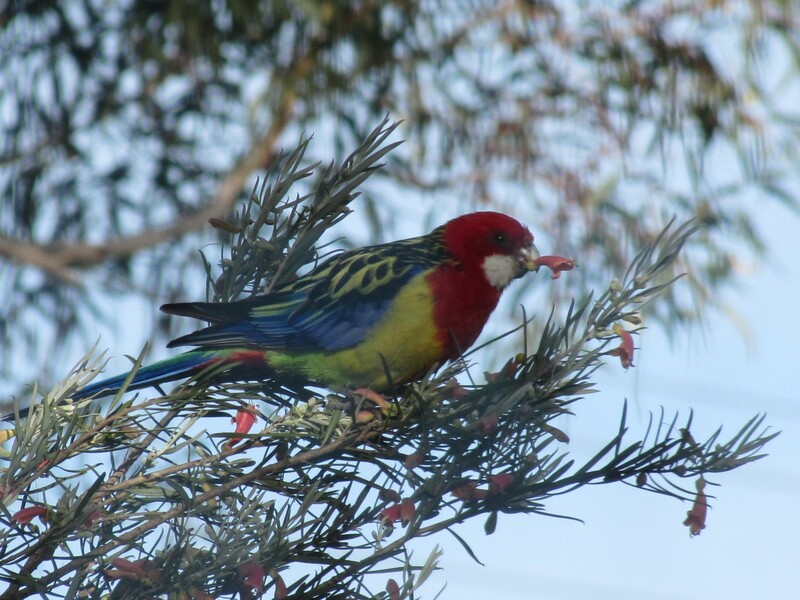 On Wednesday it posed nicely for my camera while eating the flowers of one of our Eremophila youngii bushes. Eremophilas – articles about Eremophilas on my wife’s site.